CrackBerry Asks: How do you discover new people to chat with on BBM? How do you primarily discover new people to connect with on BBM? The majority of the world's 78+ million BlackBerry subscribers use BlackBerry Messenger daily. Many of those keep their BBM list to the minimum, only adding people they personally know. Many others take a more social approach to BBM, actively seeking out new people to add to their contact lists and connect with. 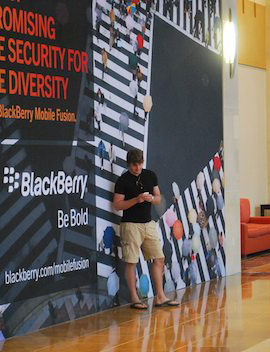 Within CrackBerry's forums, our Social Users & PIN/Barcode Sharing forum is always bustling with activity. Browsing through through the topic threads, you'll find just about every category and interest imaginable is covered. It's a great way to discover new BBM contacts. It has been for years and will be for many more years to come. But it's not the only option. Over the years we've seen a lot of different BBM PIN exchange type of services come and go. In fact, CrackBerry pretty much took the lead here too. Long time readers of the site will remember when we introduced the BlackBerry Pin Exchange as a Facebook application back in 2008. It grew pretty fast for a while, but after our developer fell off the grid and Facebook kept changing things up, we let that one fizzle out. Question of the Week: How do you primarily discover new contacts for BBM? Do you shun that practice and just stick to people you know? Or do you proactively try to discover new peeps? If so, how?! Are you in the forums? Using an app? Which app? Sound off in the comments and let us know!